Quaid-e-Azam Thermal Power (Pvt.) Limited “QATPL” intends to improve its workflow through implementation of ERP (Oracle / SAP or Equivalent). QATPL invites applications for prequalification from reputable and experienced registered entities that have expertise and proven track record in undertaking similar work for a large organizations like QATPL. Prequalification documents can be downloaded from QATPL’s website at www.qathermal.com or obtained from QATPL office at below mentioned address during office hours, immediately after the publication of this advertisement in press. Consultant for implementation of ERP (Oracle / SAP or Equivalent) of QATPL shall be engaged via Quality and Cost Based Selection as provided for under the Punjab Procurement Rules 2014. Professional firms and ERP solution providers with a strong portfolio of reputed clients and with the ability to meet QATPL’s requirements are encouraged to apply. Applications for prequalification, prepared in accordance with the instructions in the PQD, must be delivered to the following address by Saturday, August 20, 2016 till 1500 hours. The applications will be opened on the same day at 1530 hours. First Floor, 7 C-1, Gulberg-III, Lahore. Quaid-e-Azam Thermal Power (Private) Limited wishes to hire services of a top rated Chartered Accountancy Firm to conduct its quarterly Internal Audit initially for one year ending June 30, 2017 with the provision of extension for next two years upon satisfactory performance. QATPL invites applications for prequalification from reputable and experienced registered Chartered Accountant Firms that have expertise and proven track record in undertaking similar work for large organizations like QATPL. Consultant for conducting internal audit of QATPL shall be engaged via Quality and Cost Based Selection as provided for under the Punjab Procurement Rules 2014. Professional Chartered Accountant firms having satisfactory QCR rating with ICAP & rated “A” on SBP list of auditors and who have a strong portfolio of reputed clients with the ability to meet QATPL’s requirements are encouraged to apply. Applications for prequalification along with necessary documents must be submitted on or before Monday, August 8th, 2016 till 1500 hours in a sealed envelope at the following address marked “Expression of Interest for Internal Audit Services for year ending June 30,2017”. Reference to the Prequalification Notice of “Prequalification for Implementation of ERP (Oracle / SAP or Equivalent)”, published on 23-06-2016 on PPRA website, the application for prequalification delivery and opening date is extended from 13-07-2016 to 18-07-2016. The applications for prequalification, prepared in accordance with the instructions in the PQD, must be delivered to the following address by 18-07-2016 at 1500 hours instead of 13-07-2016 at 1500 hours. The applications will be opened on the same day at 1530 hours. All other terms and conditions will remain the same. Applications for prequalification, prepared in accordance with the instructions in the PQD, must be delivered to the following address by Wednesday, July 13, 2016 till 1500 hours. The applications will be opened on the same day at 1530 hours. 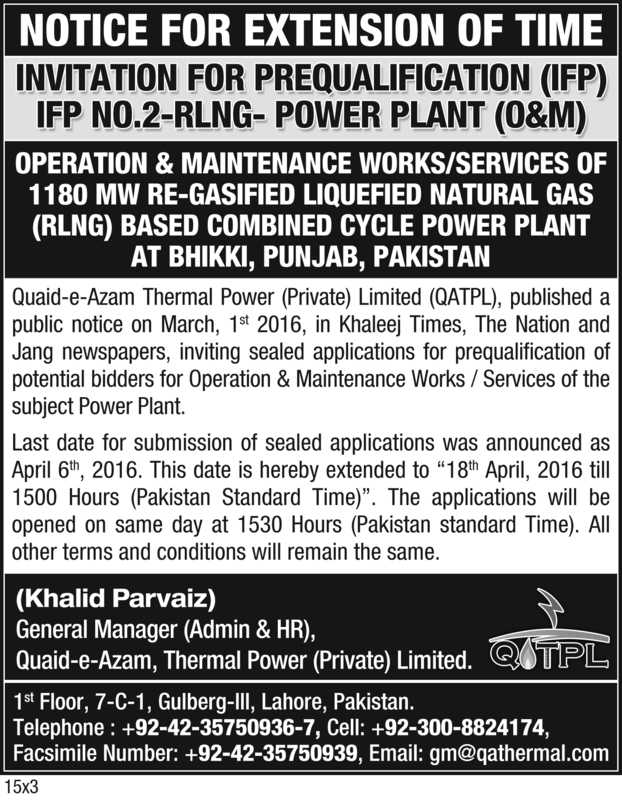 Quaid-e-Azam Thermal Power (Private) Limited (QATPL) is a private limited company, wholly owned by the Government of Punjab, Pakistan and incorporated under the Companies Ordinance 1984. QATPL is setting up a 1180 MW (Gross) Combined Cycle Power Plant at Bhikki, Sheikhupura, 60 km from Lahore under the IPP (Independent Power Producer) regime. The plant will be run on Re-Gasified Liquefied Natural Gas (RLNG) as primary fuel and on High Speed Diesel (HSD) as a backup fuel. It has two General Electric (GE) Frame 9HA.01 Gas Turbines, two Heat Recovery Steam Generators (HRSG) and one Alstom Steam Turbine. For the Engineering, Procurement and Construction of the plant, the JV of a foreign and a local company was awarded the EPC Contract in September 2015 after International Competitive Bidding. A Long-Term Service Agreement (LTSA) is also being signed with GE, the OEM of Gas Turbines. The project will be commissioned in phases; with both Gas Turbines (simple-cycle) reaching Commercial Operation Date (COD) in first quarter of 2017, and the whole plant (combined cycle) reaching COD in last quarter of 2017. Now QATPL intends to hire the services of a reputed O&M Contractor who will work in close association with the EPC Contractor during the installation, commissioning and completion stages of the project, and with LTSA contractor during operational phase of the project. For this purpose, QATPL invites sealed applications for prequalification of potential bidders for Operation & Maintenance Works/Services of the subject Power Plant. A complete set of Prequalification Document (PQD) in English language, containing all information required for prequalification including instructions for preparation and submission of prequalification applications, evaluation criteria etc. 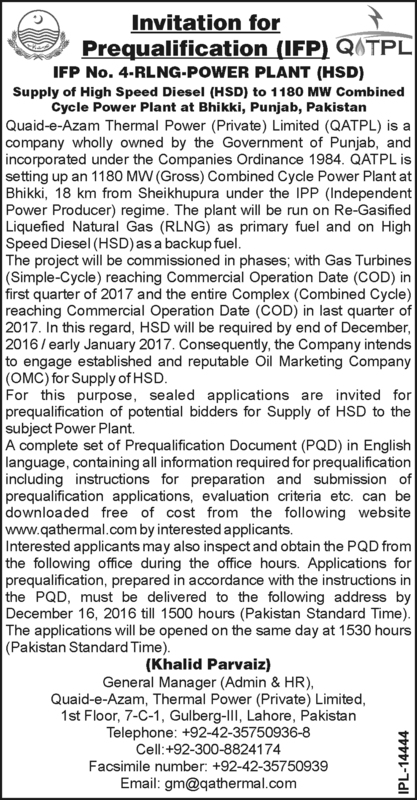 can be downloaded free of cost from the following website www.energy.punjab.gov.pk by interested applicants. Interested applicants may also inspect and obtain the PQD from the following office during the office hours. Applications for prequalification, prepared in accordance with the instructions in the PQD, must be delivered to the following address by April 6, 2016 till 1500 hours (Pakistan Standard Time). The applications will be opened on the same day at 1530 hours (Pakistan Standard Time).